Also known as oil extracts and medicinal oil. These can be used to make salves, massage oils, linaments, creams and even for cooking. You can use either fresh, dried or even a combination of both when making an herbal infused oil. There are a couple of differences in how you prepare the herbs for infusion. When using fresh, let them dry wilt for a few hours to remove some of the moisture. Finely chop them and then fill the jar 3/4 full of herb. If using dried herb, crush them up if you have a whole dried herb, if you purchased the herbs they will already be chopped finely. Fill your jar 2/3 full. If using powdered herbs, use 1 part powdered herb to 5 parts oil. 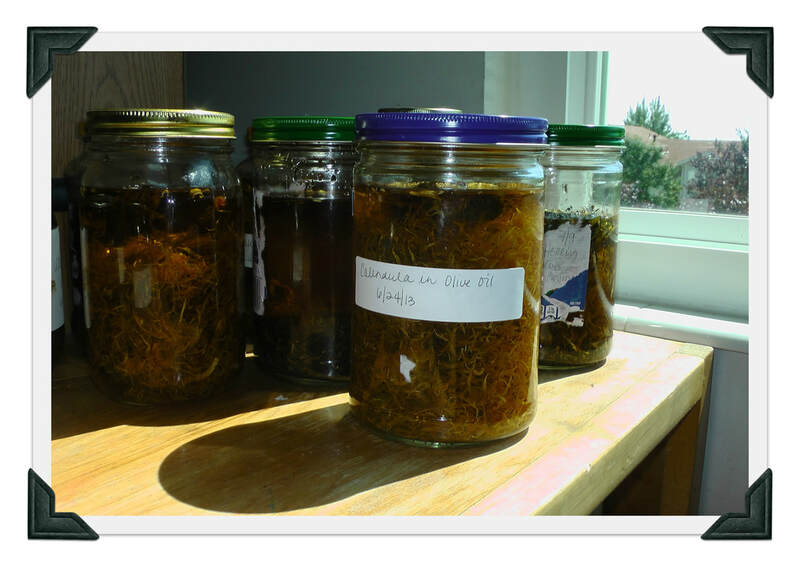 If doing a mix of fresh and dried, just be sure to dry wilt the fresh herb first and fill the jar just under 3/4 full. You can use any type of oil to infuse your herbs into and what you choose may depend on what you want to achieve. Some of the factors in differing oils are the weight; some are heavy, some light, some solidify at room temperature; shelf life, some oils go rancid quicker than others; healing properties, each oil has its own set of healing properties and functions that can play into the overall product. My favorite oil of choice, is Extra Virgin Olive Oil, it has a pretty long shelf life and full of nutrients and skin soothing properties. Other commonly used oils are; coconut (which will solidify), sweet almond, grape seed and sesame oil. You can find a list of different oils and their properties and uses here. Now that we have our ingredients, lets make some herbal infused oil. There are several different methods you can use, so check them out and find what works best for you. I personally use different methods based on the season, but my favorite is a Solar Infusion. The sun has healing properties itself and my oils are always a richer color and more aromatic than the other methods, which means more potent. This is also referred to as a cold infusion, but doesn't solar infusion sound so much more exciting. Choose your herbs and follow the method for preparing them as outlined above. Once your jar is filled with herbs, pour your, high quality, oil of choice over the herb up to the rim line of the bottle. You want to have about 1 -2 inches of head space to shake the mixture around. Place a lid on the jar for dried herbs or a coffee filter or cheesecloth fastened with an elastic or canning ring, for fresh herbs. This allows the moisture left in the herbs a place to evaporate. Label the jar and place outside in the sun, or even on a window sill that gets a lot of sun coming in. Leave the jar for 2 weeks or more, gently swishing it around each day (if you remember;). This method allows you to have your oil ready within a day rather than waiting the two. 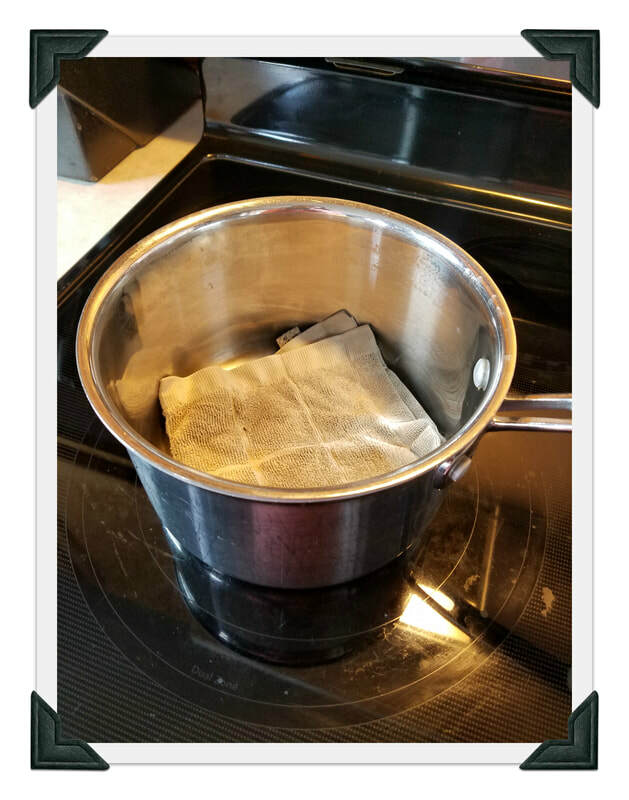 Prepare your oil as above and place the jar in a pan of water with a towel or rag on the bottom to prevent your jar from breaking. Next fill the pan with water to where the herbal infusion starts or to just below the top of your pan, depending on how big the pan is. Bring the water to a soft simmer on low heat and let the oil sit in the simmer water for a minimum of 4-5 hours and up to 72 hours, swishing it gently every once in a while and keeping the water filled as it evaporates. 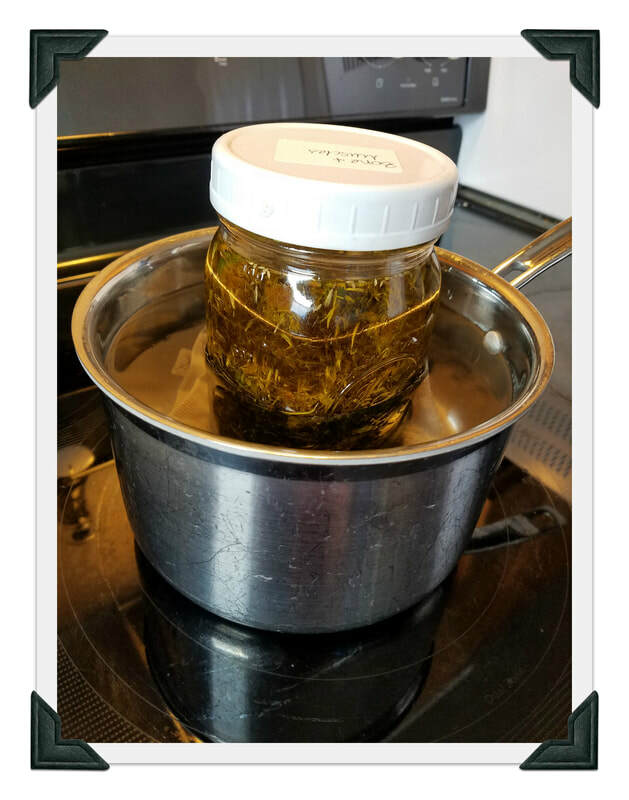 ​I love this method the best for hot extraction, not only do you not have to worry about watching the stove, you can fit two to three jars in at one time. Line your slow cooker with a towel, just like we did for the stove method. Place in your jars and then fill the crock pot up to the top with water. Set on low for 2-3 days, keeping the water filled to the top. My cooker only does 10 hours or slow cooking and switches to warm, which is fine, but I just restart the time on low and go the full 3 days. ​Place herbs in a pan with enough olive oil to cover the herbs. Turn the heat on low until it begins to simmer. Let simmer for a few minutes, and then remove from heat. Let cool. Strain herbs from oil. Be careful with this method because you do not want to burn your oil or herbs. Watch carefully and go by smell. You can also use a double boiler by placing the herbs and oil in the top part of the boiler. Slowly bring the oil to a very low simmer, you want the temperature to be between 95 and 110 degrees. Simmer for 30-60 minutes, making sure the oil is not overheating. The oil should turn the color of the herbs and smell potent. Strain the herbs and bottle the oil as above. Once your oil is done macerating, you want to strain the herbs out of the oil with an actual strainer, cheesecloth or any other device you may come up with for separating the oil from the herbs. 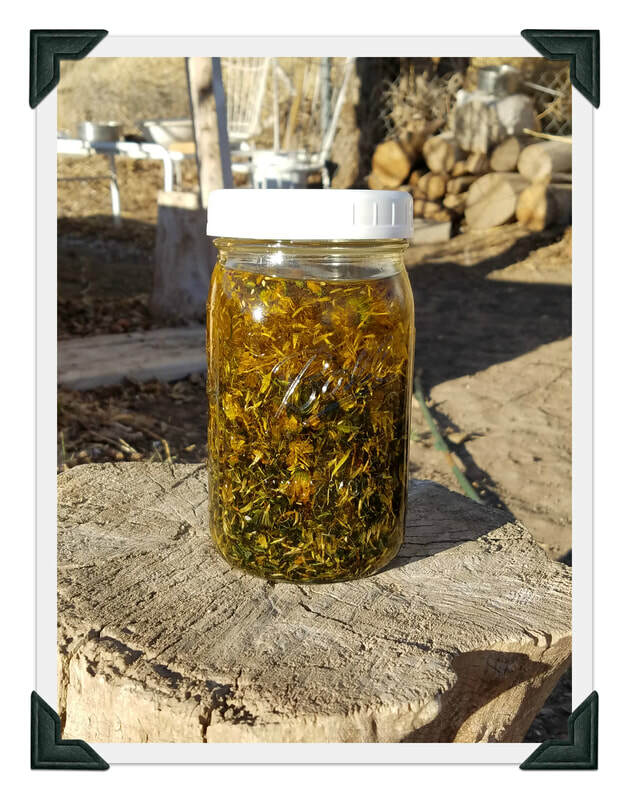 For a more potent oil place a fresh batch of the same herbs into a jar and pour the strained herbal oil over them, place in your sunny spot or back in your pot and infuse for another go around. This is called a double infusion. If your ready to move on, you can add 10-15 drops of rosemary or benzoin essential oil as a preservative to prolong the shelf life of your oil. Store in a glass container with a label of the herbs you infused and the oil used. Store in a cool, dark location where your oil should last from several months to a year. When the oil loses its color and starts to smell rancid, you know it's gone bad and need to discard. You can now use your oil in your cooking, as a massage oil, as a liniment, an ointment for the eyes and ears, as a wound dressing, nasal application or turn it into a salve.